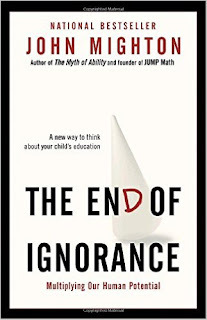 Book Review: "The End of Ignorance"
The End of Ignorance by John Mighton is, in essence, a book about capitalization. Capitalization, as defined by writer Malcolm Gladwell, is “the rate at which a given community capitalizes on the human potential… what percentage of those who are capable of achieving something actually achieve it.” In this book, Mighton attempts to show how our current attitudes towards education is detrimental to capitalizing on a student’s full potential. He challenges widely held notions about aptitude and educational methods, especially as they pertain to students viewed as having low intellectual ability. This book aims to move away from the traditional view that children are born with high intrinsic aptitude in some areas and low aptitude in others. Mighton draws from recent research in neurology and cognitive science to show that all children have the ability to learn deeply in almost any subject, and that the brain is plastic enough to allow for new abilities to become highly developed in even damaged brains. Mighton argues that children, therefore, are not usually held down due to their own limitations, but rather the limits set by others’ expectations. He also shows how, with information about how a child’s mind develops and acquires new abilities, more effective methods of teaching can be developed. Mighton is the founder of JUMP, an organization that provides mathematics education for those students who would otherwise labeled “hopeless”. Mighton draws heavily from his experiences working with struggling students to demonstrate his ideas at work. He shows how, with an attentive and experienced teacher, students can overcome their anxieties surrounding mathematics. He shows how they can move past their self-doubt, a product of having been labeled bad or unintelligent students, and how by challenging them, rather than boring them, one can inspire a new sense of passion. Too often it is the case that schools give up on students. In losing interest in the subject and confidence in their abilities, their potential is never realized. It is in failing to capitalize on a student’s full palette of abilities, Mighton argues, that society and the educational system has fallen short.